Recently tonnes of oil slick and oil tar were washed off into the Arabian Sea, polluting half a dozen beaches in Goa. This is the second such incident to have occurred this year in India's top tourist destination. L U Joshi, chairperson, Goa Pollution Control Board blamed big ships, empty tankers and ocean liners which wash themselves in the Arabian Sea after delivery, a practice that is otherwise banned. 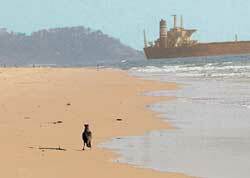 The beaches mainly hit by the crisis were the south Goa beaches where huge quantities of oily substances were found. Meanwhile coast guard authorities in Goa refute this explanation and cite natural churning process or vigorous monsoon as possible causes but added that it was difficult to pinpoint the actual cause. Some claim it to be a planned eco-terrorist attack on the beaches to break the backbone of the tourism industry Meanwhile, the government has employed men to clean up the beaches before the tourist season starts.